Garage floor tiles are often overlooked but they come with a range of benefits once installed. Not only do they look great but they protect the concrete from contaminants, provide insulation in cold garages and have anti-slip qualities. 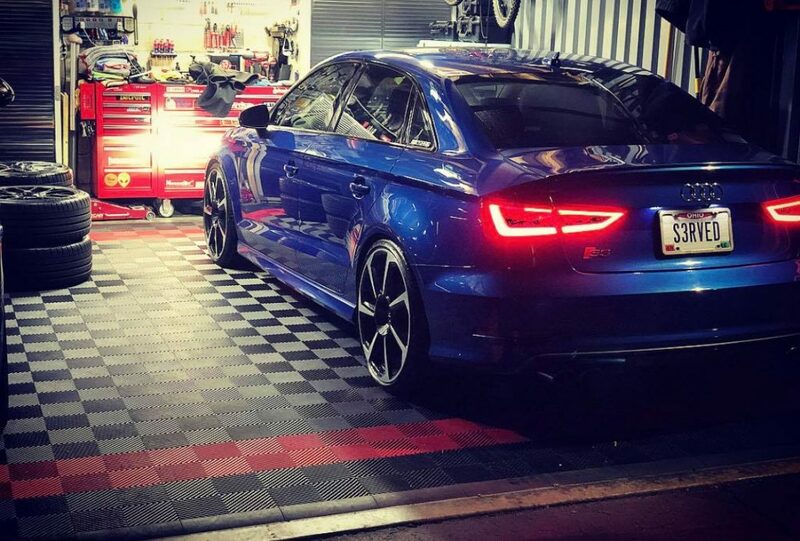 The best garage floor tiles are the RaceDeck Interlocking Tiles, which are constructed of a high impact copolymer that are suitable for 80,000 LBS. Unlike garage floor mats, tiles are interlocking and allow you to be creative with your flooring. You can either opt for a simple one color tile setup or choose multiple colors with various designs to create patterns and jazz up your garage flooring. 7.3 Which Garage Flooring Tiles To Choose? Interlocking garage floor tiles are simple to install and require no tools to assemble as they snap together with very little effort. The majority are made from an impact resistant thermoplastic polymer, which is highly durable and ideal for heavy vehicles. Unlike floor mats, if a section of the flooring becomes damaged, you are able to simply replace a single tile. Tiles are often thicker too, which means they provide additional durability, insulation and other qualities. Most people will install a mixture of vented and solid tiles to ensure fluids can drain away and air can pass to prevent mold buildup. Below is a list of the best garage floor tiles that provide an effective solution to garage flooring and are available in a range of designs and colors. RaceDeck is a premium manufacturer of garage floor tiles with a wide variety available. As shown in the main photograph of this article, once fully installed, these tiles provides a very desirable high-end look whilst providing floor protection. The RaceDeck patented substructure design is not only aesthetically pleasing but also provides a purpose. It allows air into the tile, which prevent mold and mildew buildup. Colors available include alloy, beige, black, bright blue, graphite, orange, purple, red, white and yellow. Although they are fairly expensive, as you can see from the huge feature list above, they are by far a worthwhile investment. They are the best garage floor tiles you can buy with a range of colors available to produce a range of patterns. The ease of installing them together is far easier than you expect too. This is thanks to a “Step-N-Snap” design, which requires no special tools. The most popular garage floor tiles are these Speedway tiles, which are a heavy duty polymer construction. Unlike many of the alternatives, these are the least likely to separate or produce gaps as they have an impressive 6 tab per side. Colors available for these garage floor tiles include black, silver, red, blue, orange, white, yellow, Green, Beige, purple, and terra cotta. Each color that you choose comes in packs of 50 tiles. Overall, they are excellent all-rounders that will not disappoint has 6 tabs on each side of the tile for maximum durability. For those that are on a budget or have to cover a large area, the cost per tile may be the biggest factor. However, you wouldn’t want the cheapest that will not be able to last but alternatively, you will want the best bang for your buck. This is where the IncStores Nitro garage flooring become fairly desirable and for peace of mind, they come with a long 3 year warranty. Overall, the IncStores Nitro tiles provides the best value for money and the brand offer vented, coin and diamond tile designs so that you can perfect your garage floor. 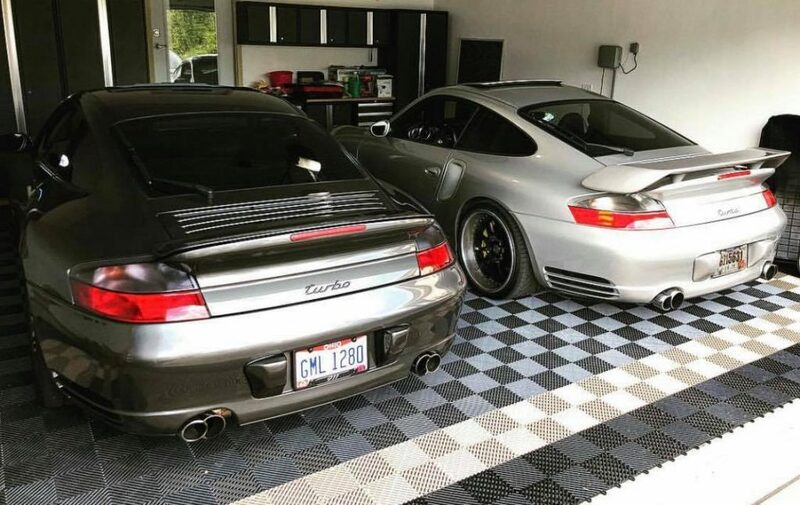 GarageTrac garage floor tiles are a US made affordable tile that are compatible with the RaceDeck alternatives above. This is thanks to the same 4 tabs that interlock together along with a patented design. The GarageTec garage floor tiles are the perfect combination for those using RaceDeck Free Flow tiles. They can also be used in other areas around the house from the gym to the shed too. For those that want to cover a larger area per tile, then the Greatmats tiles are the best option at 20 x 20 inches. Each pack includes 8 tiles that are suitable for 22.16 square feet coverage and they are easy to install to without adhesive required. The larger tiles means that installation will be quicker, which is great but there are drawbacks. These include the lack of colors for those wanting to jazz thing up and that they are fairly expensive too. The main purpose of garage floor tiles is to protect your concrete floor from the likes of oil, gas and other automotive fluids. Unless you have recently used garage floor coating, they also provide an effective method of hiding imperfections such as cracks and previous damage flooring. These days, you are able to pick up a variety of interlocking garage floor tiles where you can produce patterns and jazz up your garage flooring. However, before you go out and buy the first tiles you find, we have produce the below buying guide to help you make a more informed buying decision. Many people will think that tiles are pointless because concrete is the only flooring you require in your garage. However, this is simply untrue because the floor in your garage goes through much more tougher conditions that your average floor. From heavy tools falling on the floor to dangerous fluids such as brake fluid falling on the floor. The end result is a floor with stains and holes, which is not very appealing. By installing garage floor tiles, you protect the flooring and cover up existing defects. They are also great for improve grip because as you drive in the car into the garage, it will also bring in the rain, snowmelt and other outdoor elements. Interlocking garage floor tiles is becoming very popular throughout garages worldwide. They are an easy way to cover your flooring and allow you to create any pattern you wish. Popular patterns include colored borders, checkered flags and much more. The surface of the tiles usually includes the option to choose a free-flow, ribbed, diamond plate, coin and some brand offer further designs. Most interlocking tiles for your garage will be 12 x 12 and made of a high impact polymer or PVC. The materials are resistant to most automotive fluids and provide excellent qualities such as UV resistant and anti-slip. With the variety of interlocking garage floor tiles available, you are able to produce attractive flooring inside your garage. Below is an example of various RaceDeck tiles being used (mixture of vented and diamond designs) with an outer red border effect. This has the result of completely transforming the garage. Which Garage Flooring Tiles To Choose? When you have found the garage floor tiles you want, you will need to decide on which type of tiles to get. It is highly recommend to have a number of free-flow drainage tiles such as the RaceDeck included in your setup. This will allow any fluids i.e. water, melted ice/snow or oils to drain away thus providing you with extra grip on the tiles. Only using solid garage flooring tiles will mean the fluids will not be able to drain away. Another benefit is of course that they look great when used in the flooring setup. Some garages can be huge and covering the whole floor can be relatively expensive. If you have a relatively small garage, this is not a problem but if not, ensuring the dimensions of the car and near any tools would be the best area to tile. If you want to introduce patterns to your garage flooring, you will want to have a plan in mind beforehand. You will also not want to block any drains present in the garage as you will want any water or automotive fluids to drain freely. Installation itself is fairly straight forward with all the recommendations simply clicking/snapping together. You will want to ensure that on each tile the tabs connect properly. If they do not, you may see gaps appear overtime. When it comes to tiling your garage floor, there are alternatives to interlocking garage floor tiles. You could opt for the porcelain alternative, which will leave you with a premium look and feel to your garage floor. It is used in most professional dealership garages but costs far more per tile, can break under heavy impact and installation is far more time consuming. Also, you cannot exactly remove the tiles and take them to another garage i.e. when moving house. Since all of the recommended garage floor tiles in this article tick all the boxes, there is no wonder why they are becoming increasingly popular. If you want an easy method of improving your garage, then garage floor tiles is an excellent upgrade. Not only do they look great but they provide a range of functionality and are long lasting with the ability to remove them and use elsewhere.